Nearby attractions, such as Blue Chip Casino, lend themselves well to a work-hard, play-hard philosophy. La Porte County Office of Economic Development joins forces with partners across the community to develop La Porte County into a desirable place to work, grow businesses and enhance the local economy. Kingsbury Industrial Park offers over 600 acres of shovel-ready land with on-site utilities. Chicago South Shore Railroad connect Northwest Indiana’s industrial corridor to Illinois International Port and all of Chicago’s Class I railroads. 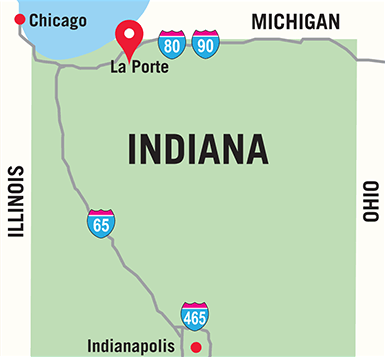 La Porte County is home to many transportation amenities, including LaPorte Municipal Airport, that make it easy for companies to visit their site. La Porte County Office of Economic Development takes a forward-looking approach to workforce and business development in northwest Indiana. Are You Wired? Do You Want to Be Wired?